Like every major tourist city around the world, Barcelona has its “hit list” of places and experiences that most tourists don’t want to miss. There’s a walk down Las Ramblas (where many of the best hotels in Barcelona are located), a trip to the top of the Sagrada Familia, a stroll through the Barri Gotic, a tapas tour, and a visit to La Bouqeria market. While these are all worthwhile experiences (they are the hits for a reason after all) why not spice up your trip by checking out some of these lesser known highlights of Barcelona? 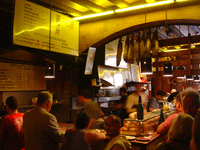 There’s so much incredible food to be had in Barcelona. From fresh seafood paella to traditional tapas dishes to rich desserts, and you don’t have to say goodbye to it once you leave the country’s borders. 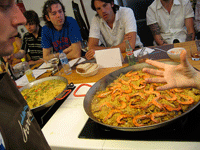 Take a cooking class at Cook and Taste and you can recreate the flavors of Spain at home. During half-day classes, students learn all about the cuisine of Spain while helping to prepare several traditional dishes like paella, crema Catalana, and gazpacho, all while sipping Spanish wines. Skip sipping the overpriced sangria sold at tourist spots and instead join the crowds of locals, students and travelers pushing their way into Can Paixana, a tiny bar that serves glasses of cava (Spanish sparkling wine) for one Euro each. If you come before 5pm, you can score an entire bottle for 3 euros, so long as you “splurge” on a few cheap and tasty sandwiches to go with it. Like Gaudi’s other Barcelona landmarks, Parc Guell is a whimsical work of Modernisme art and architecture. Unlike the other landmarks, you can visit it for free. The park is quite big, and though it’s a very popular place for tourists, there are lots of quiet spots where you can escape the crowds. So pack a lunch and spend an afternoon exploring, people-watching, and taking in beautiful views of Barcelona. For another great view of the city, head to Montjuic. This large hill overlooking the city previously hosted the summer Olympics. Now visitors come to see the National Palace, several museums including the excellent Fundacio Joan Miro, the Olympic stadium, the Montjuïc Cemetery, botanic gardens, and more. Come early and expect to spend at least a few hours in this beautiful city-within-a-city.